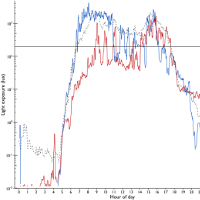 The timing, intensity, and duration of exposure to both artificial and natural light have acute metabolic and physiological effects in mammals. Recent research in human adults suggests exposure to moderate intensity light later in the day is concurrently associated with increased body mass; however, no studies have investigated the effect of light exposure on body mass in young children. We examined objectively measured light exposure and body mass of 48 preschool-aged children at baseline, and measured their body mass again 12 months later. At baseline, moderate intensity light exposure earlier in the day was associated with increased body mass index (BMI). Increased duration of light exposure at baseline predicted increased BMI 12-months later, even after controlling for baseline sleep duration, sleep timing, BMI, and activity. The findings identify that light exposure may be a contributor to the obesogenic environment during early childhood. This Australian study started with 49 children age 3-5. There were two parts. First part of this study was a 14 day assessment period. Researchers assessed Body Mass Index (BMI) and fitted the children with an actigraph wrist device that tracks motor activity and white light luminance in one minute increments. Parents also kept a sleep log. The actigraph used was the Actiwatch 2 by Philips. It’s basically like a clinical version of the FitBit. All but one of the children were a healthy weight; one was classified as overweight/obese. One child did not complete the initial assessment period bringing the sample size down to N=48. The second part was a followup assessment of BMI 12 months later. Only 39 children completed the followup portion. All but two had a healthy BMI, one was over weight and one was obese. Even though most had a healthy BMI, children with longer light exposure had a statistically significant increase in BMI. Valid actigraphy recording had a mean average of only 10.7 days. As if 14 days wasn’t short enough. Is this really enough of a sample period to project light exposure for the entire year? I question the accuracy of the actigraph light exposure records. Light measured at the wrist is not the same as light input into the eye. For example, staring into an iPad will not be accurately reflected in the actigraph data. Unfortunately, when I see a kid on an iPad it’s typically inches from their face! Also overnight data may be confounded by the use of blankets. Light spectrum was not recorded which is unfortunate. They do make a Actiwatch Spectrum that records it but perhaps they didn’t have funding for that model. Very heavy use of statistical analysis. Of course most studies make use of statistical models and corrections to data. But every time a calculation or statistical model applied, distortions occur and assumptions are imprinted in to the data. This is particularly true with small sample sizes! Which brings me to the next limitation: Small sample size. With N=48 and N=39 in each phase, this is quite a small study with which to draw conclusions from. Their results show that earlier light exposure was associated with higher BMI. “…for every hour earlier that…[illumination above set threshold]… occurred during the day there was a .6 unit increase in BMI.” Wow! The authors do note that this is in direct contrast to studies where early light exposure has a favorable association to BMI in adults. 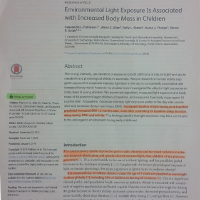 They cite possible “…variations in biological timing and threshold of exposure at which light exerts an influence on physiological processes in young children.” What is also interesting is that “…the timing of light exposure at baseline was not predictive of BMI 12-months later, the duration of light exposure was”. So, even though in the initial baseline assessment early light was associated with higher BMI, this seemed to have no bearing on BMI 12-months later. It’s hard to know what this means, if anything. Further studies with larger sample sizes need to done. I’ll quote from the study: “This result indicates that longer daily duration of light exposure greater than 10 lux at baseline is associated with increased BMI 12-months later, independent of baseline BMI, activity, sleep midpoint, and total sleep duration.” Btw – 10 lux is about the brightness of a candle or nightlight. This study further adds to the overwhelming evidence that light has profound impacts on our physiology. If you enjoyed this article please share it with anyone you know who would be interested. Thanks for reading.